Download this book (right-click or alt-click) free of charge for a printable PDF file. This little booklet contains nineteen tunes and dances that originate from Provence, Morvan and the French Alpes. Gilbert Carrère has been involved in folk music and dance for more than twenty years. He was born in Provence, and he is particularly familiar with the traditional folk dance and music repertoire of this region of France. Gilbert learned his repertoire from friends, musicians and dancers, on courses and workshops, and also, more directly at folk dances (bals). 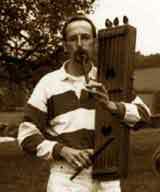 Gilbert's favourite instruments are the galoubet (three holed flute) and tambourin from Provence. He also plays concertina. Gilbert is a member of the french folk band "Ti Fau Dansar" who play for concerts and dances. He also performs as a solo singer and concertina player. Puppets are Gilbert's second 'passion' and, at the beginning of 1995, he and Armand Castagnetta formed "Le Theatre du Blaiseron", a puppetry company using marionettes à fils (string puppets). Their shows are primarily for children and often end in a dance workshop for the audience. Gilbert has led music and dance workshops in France and England, and "Le Theatre du Blaiseron" performed for several Yorkshire schools in September 1998 during Yorkshire Dales Workshops' French Festival. Branle "Le Maitre de Maison"